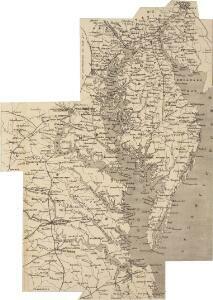 1 : 354816 Lucas, Fielding Jr.
A Chart of the Chesapeake And Delaware Bays. A map of Virginia : formed from actual surveys and the latest as well as the most accurate observations / by James Madison ; drawn by Wm. Davis ; with extensive additions and corrections to the year 1818. 1 : 346480 MacCormac, Walter S.
Maryland und Delaware / entworfen von D.F. Sotzmann ; W. Sander, sculp. States of Maryland and Delaware. 1 : 800000 Winterbotham, W.